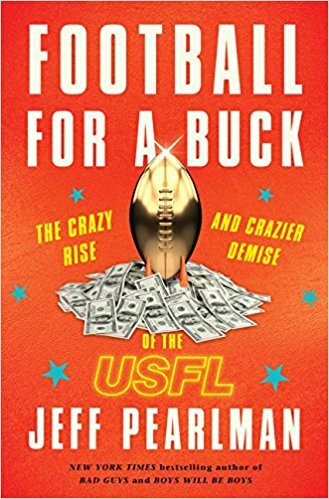 Brooklyn Digest: Books: Jeff Pearlman On The USFL & The Donald In "Football for a Buck"
Books: Jeff Pearlman On The USFL & The Donald In "Football for a Buck"
How does a league that faded from existence over three decades ago still fascinate people today? Well, when it was a league stocked with superstars and one of the most prominent owners went on to be President, you can see why. Jeff Pearlman, New York Times bestselling author of eight books, looks at this league in the new book Football For a Buck: The Crazy Rise and Crazier Demise of the USFL. The United States Football League, known as the USFL to its millions of fans, was the last football league to challenge the supremacy of the NFL, while causing its owners and executives to collectively shudder. The USFL lasted three seasons, from 1983 to 1985, secured multiple television deals, such as with ESPN, and launched the careers of legends including Steve Young, Jim Kelly, Herschel Walker, Reggie White, Doug Flutie, and Mike Rozier. One of the owners, of the New Jersey Generals, was New York businessman Donald J. Trump, who took the NFL to court and that eventually led to the downfall of the USFL. Currently, as President of the United States, he is waging a different battle with the NFL, over players standing for the national anthem. Pearlman, whose football books include Boys Will Be Boys on the Dallas Cowboys in the 1990s, and Sweetness on Walter Payton; draws on more than four hundred interviews to capture the salty, untold stories of this crazy sports empire that captivated America. Football for a Buck transports fans back to this crazy, boozy, audacious era of football and sheds light on the excess drug use in the 1980s to airplane brawls, to player-coach punch outs, to backroom business deals, to some of the most riveting football ever seen in the USFL. Pearlman shows how people made and lost fortunes on the backs of professional athletes and and how Trump who was a spoiler and scoundrel. After establishing itself as a spring football league and drawing a following that rivaled the NFL, Trump wanted to take on the NFL and play in the fall. How he went about this sounds all to familiar to anyone that follows his presidency on a daily basis. "The question sat there, and nobody was 100 percent certain how to answer," writes Pearlman. "With the conclusion of the USFL's third and final spring season, there were big things to do. Huge things to do. Enormously important things to do. "The antitrust lawsuit filed against the NFL would finally be heard inside a New York federal courtroom in the spring of 1986, but in the meantime there was a chaotic tidal wave of confusion. What should happen to the players? The teams? The uniforms? "For all his bluster about the USFL switching to a fall schedule, Donald Trump sure wasn't big on details and specifics. Neither, for that matter, was Harry Usher, a lovely man with a thick resume and glorious hair who appeared increasingly incapable of handling the task placed before him. Other than assuring journalists that - win or lost its lawsuit - the USFL would go on in the fall of 1986, Usher was a sprinkler lacking water. When he spoke, nobody seemed to listen. When he didn't speak, people wondered if he ever opened his mouth. In July, he declared the USFL's next season would likely include 12 teams, not 14. Which was a departure from Trump's statement that the USFL should have 8 teams, not 12. There was talk of the Denver Gold moving to Honolulu, as well as the Denver Gold merging with the Portland Breakers. The Los Angeles Express were said to be headed to the San Fernando Valley - or the graveyard. The Tampa Bay Bandits and San Antonio Gunslingers were prepared to become one and relocate to...Chicago? Then, on July 23, the Gunslingers waived all 46 of their players because the owner, Clinton Manges, was broke. 'I regret that the players are unpaid,' Usher said meekly. 'I hope that they are paid in the near future.' They never were." Football for a Buck shows how sport can be high entertainment, but also a cautionary tale of ego and excess. It shows why people still lament a league that lasted just three years but has been examined for three decades. On why he chose to do a book on a the USFL now: Honestly, I've been itching to write a book about the USFL ever since I started in this business. But when you're a younger writer, and you need to establish both your ability to compile information and your ability to sell copies, well, it didn't strike me as an ideal plan to chronicle a long-defunct league. I mean, just being real here - it's not as obvious a big-ticket item as, say, Brett Favre or Walter Payton. It was a passion project. Now, though, I'm eight books in. I've had some success in this business, I've established at least something of a reputation. And I really wanted to do this. I love the USFL. Everything about the USFL. The crazy uniforms and team names and logos. The impossible-to-believe stories about drugs and wayward flights and cigarette-smoking players eating ham sandwiches on the sidelines of games. One of my favorite all-time books is Terry Pluto's "Loose Balls" about the old ABA 0 and this, in many ways, is "Loose Balls" for football. Only the stories are oftentimes even more outrageous and hard to fathom. So timing? There wasn't much thinking about timing. It was a subject I felt compelled to hit. On the elephant in the room with the story of the USFL - the 45th president. On what reporting and writing Football for a Buck during Donald Trump's campaign and ultimate election was like: Maybe the strangest thing I've ever experienced as a journalist. Here I am, simultaneously going back in time to watch Donald Trump enter - then ruin - a football league as he's campaigning for the presidency. I mean, super weird. And hard. Because, if we're being honest, Trump was a poisonous snake when it came to the USFL. He never showed an ounce of concern for its long-term success. He wanted an NFL team and saw this as the easiest route. He stomped on heads, crushed dreams, lied about 100 times a day - and when the USFL died he ultimately referred to it as "small potatoes." So, at the risk of making this overly political, knowing how Donald Trump ruined a tremendous football league hardly inspired my confidence in 2017. On who he considers the greatest player to emerge from the USFL: God, there are so many to choose from. Obviously you have Steve Young and Jim Kelly, two of the finest quarterbacks in pro football history. You also have Reggie White, the legendary pass rusher. Herschel Walker was amazing. Kelvin Bryant was amazing. Tim Spencer was amazing. The list of NFL stars - from Doug Williams to Craig James to Joe Cribbs and Raymond Chester - goes on and on. I guess, for me, it comes down to Sam Mills, the Philadelphia/Baltimore Stars linebacker who went on to a terrific 12-year NFL career. Mills died of cancer in 2005, and his exclusion from the Pro Football Hall of Fame is shameful. Here's a guy who played at Division III Montclair State, a guy who was cut by multiple NFL and Canadian Football League teams; a guy who was teaching photography at a high school in New Jersey when the Stars called with an invitation to training camp. Jim Mora told me Mills is the greatest player he ever coached - and that list includes Peyton Manning. So, for me, Mills is the greatest of an endless number of greats. Who his favorite character is in Football for a Buck: So many to choose from, but only one righteous answer: Greg Fields. Greg is, maybe, the greatest character in the history of the human species. He was a pretty OK defensive lineman at Grambling who went on to play a few unexceptional seasons for the Baltimore Colts. He attended training camp with the Atlanta Falcons in 1982, and - upon being cut - locked himself in his room and refused to leave. The team needed to find an armed police officer to get him out. Greg then signed with the Los Angeles Express, played the 1983 season, then was cut in camp a year later. Only when John Hadl, the Express coach, told Fields he was done, well...Fields wasn't having it. He punched Hadl in the face, and security guards stormed the office to separate the two. But wait - there's more! According to the Express, Greg started calling in death threats to the team's headquarters. So the franchise hired away Liberace's chief of security to come to L.A. and - specifically - be on the lookout for Greg Fields. So he moved to California from Las Vegas, put a tracer on Field's car, followed him around, reported on his whereabouts. Then, because the USFL was the USFL, the San Antonio Gunslingers signed Fields. Which is awesome in and of itself - without Fields following the team owner home one day and threatening him with a baseball bat. Yes, I found Greg Fields. Not only that - my 10-year-old son Emmett and I had ice cream with him inside a Sacramento shopping mall's food court. If the USFL could have lasted had things gone differently: Honestly - probably not. A lot of wealthy men were losing big dollars, and I'm not sure the patience would have maintained. That said - Donald Trump killed hope. Had the New Jersey Generals owner never come along, we're likely talking about a handful of teams being absorbed by the NFL. Certainly the Baltimore Stars and Jacksonville Bulls would have been ideal candidates. The Orlando Renegades were not a great product, but the city could have been appealing to the NFL, too. The Memphis Showboats drew well, as did the Birmingham Stallions. Some of those franchises would have wound up in the NFL. So - would the USFL have survived? No. But it would have lasted longer, and some of those teams would be carrying the legacy and tradition to this day.